Koshka gains 0.5 move speed for each enemy she hits with her abilities. Lasts 5 seconds. Max 4 stacks. Koshka dashes to the target enemy and deals damage. Pounce cooldown is reduced by 2 seconds each time she executes a basic attack. 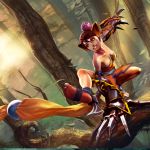 Koshka twirls, damaging all enemies around her. She gains a boosted basic attack for each enemy hit by the twirl (up to 12). Twirl cooldown is reduced by 2 seconds each time she executes a basic attack. Koshka leaps at her target then launches into a flurry of slashes, stunning the target for the entire 2.2 second duration. Cooldown is reduced by 1 second each time she executes a basic attack. I used to go to EDM shows a couple years ago, and when we made Koshka, I immediately thought the culture totally clicked for her personality. She reminded me of kandi ravers early on because of her ultimate: Right before she attacks, she jumps up like she wants to give you a hug. In fact, whenever Captain Neato plays her, he says, ‘Hey, lemme give you a hug!’ She’s disconnected from everyone else’s reality and way too happy. She is a girl without a history who tries on whatever style she likes. She isn’t a cat; she’s just convinced she’s one — and that’s a big part of rave culture: having the freedom to be something or someone else for awhile. 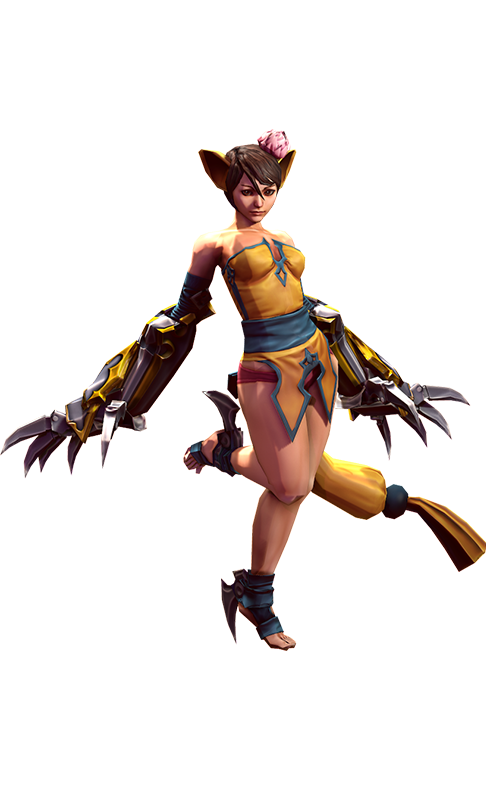 Unlike the lore-heavy characters, Koshka is more of a hero born to just have fun. Pathetic creatures, the humans. Ambition and cunning they have, but few survival instincts in the wild. The last time they made camp in Grangor territory, blasting holes in the hills in search of crystal, my family laid waste to all but the children. We kept the young in an effort to understand their kind, raised them like our own. I chose to mother one of the females, and I called her Koshka. As she was, she would never have survived in the wild – not even with my protection. She did not camouflage into the underbrush. Her nails and teeth were worth next to nothing. Our world was dangerously unsuited to her, but I formed a bond with the little scrap of a thing. She learned quickly, for a naturally incapable kind of creature. In the thick weeds she crouched, silent and invisible. She climbed the highest rattan and pounced down without fear. Once our metalworkers fashioned claws for her, she was a useful hunter. She thought ahead of her prey, cornering animals in the trees. She could trap a spider in a single eight-meter pounce. Her curiosity caused her to leave me. Perhaps she seeks her own kind. I see her seldom now, though stories of her travel into the mountains. They make me laugh: psychotic jungle cat fighting for one side and then the other at random. Truly, she has no foes: In her world, everything is play. Beware, stranger: She is ruthless with her toys. MORE KOSHKA LORE: KOSHKA FINDS A SCOUT TRAP!